When you convince, cajole and caress the proprietors of one of the most favoured chamber music venues in the world to open their doors to a sampling project and they say "yes you can have it for one day in August" what do you do? You wait. You wait for that day to come and you plan and you put together a crack team of engineers and you prepare your band and you get as much as you can. And then you wait, you wait until that day comes around the next August, you repeat the operation…. and then you wait, you wait until the next August! Sacconi strings is a four year long project to create a definitive set of writing-for-quartet tools, a game changing set of solo strings recorded at Wigmore Hall and performed by one of the most talked about young quartets to be formed in London for many years. When writing for quartets composers naturally have to settle with using solo strings VIs to mockup their intentions. The difficulty here is they tend to be very ‘neck up’ soloistic and when combined into a foursome can be jarringly expressive and difficult to sell to clients. Spitfire’s Christian Henson has worked with Sacconi for many years and thanks them for helping him understand what works for a quartet and what makes a quartet gel. Christian took this relationship alongside the searing talents and understanding of virtuality of Andy Blaney into the Wigmore to commit a very different approach to sampling to the digital sphere. Combining modern techniques and exploratory approaches to vibrato alongside stunning traditional articulations blooming this extraordinary acoustic Sacconi has been everyone’s pet project at Spitfire. In what can only be described as a ‘coup de grace’ Spitfire’s Stanley Gabriel massaged some family connections and cajoled the proprietors of the Wigmore Hall into letting us in. He put together a crack team of operatives, researched various famous recordings made there and built us a remote recording facility in but two hours of them letting us in. The minute though that Spitfire engineers started scratching mics and listening back to sound checks via monitors in the hastily put together control room stationed in the green room behind the stage, did the magic really start to happen. Quartet features the searing talents of Ben Hancox, Hannah Dawson, Robin Ashwell and Cara Berridge whom when not performing with Sacconi can often be seen on scoring stages performing on many of the top film scoring sessions in London. The quartet library features individual instruments which can be used in two modes, the traditional ‘keyswitching’ method that changes articulation type via inaudible notes being hit on your controller. Or indeed "performance patches" which is an ingeniously scripted automatic tool that analyses the way you’re playing and interprets the style of performance you need – selecting from Spiccatos, various longs, and a selection of True Legato transitions, for maximum expressiveness. Quartet also contains a brilliantly useful ‘baked’ ensembles section that allows you to sketch your quartet composition with both hands before splitting off into the separate parts. The library contains 6 different microphone perspectives, including the main stereo position which gives you the classic sound of the hall. Other positions include two close mics, decca tree, outriggers and ambients. 15 different articulations are included with the library from tight spiccatos to longs with complete vibrato control and a whole host of others in between. Check out our presets list below to see the full collection contain in the library. Beneath a golden Arts & Crafts cupola; the central figure is the Soul of Music. He is gazing up at the Genius of Harmony – a ball of eternal fire whose rays are reflected across the world. Members of Sacconi strings slavishly positioned themselves over a series of days spread over four years. The award-winning Sacconi Quartet is recognised for its unanimous and compelling ensemble, consistently communicating with a fresh and imaginative approach. Performing with style and commitment, the Quartet is known throughout the world for its creativity and integrity of interpretation. Formed in 2001, its four founder members continue to demonstrate a shared passion for string quartet repertoire, infectiously reaching out to audiences with their energy and enthusiasm. The Quartet have enjoyed a highly successful international career, performing regularly throughout Europe, at London’s major venues, in recordings and on radio broadcasts. The Sacconi is Quartet in Association at the Royal College of Music and Associate Artist at the Bristol Old Vic. 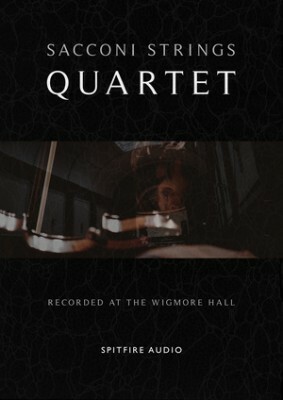 To date, the Quartet has given twenty-one world premieres and four British premieres, including works by Gyorgy Kurtag, Paul Patterson, John McCabe, Simon Rowland-Jones, Robin Holloway, John Metcalf and Alun Hoddinot, and they performed as the solo string quartet on Paul McCartney’s hit song Come Home. The SacconiQuartet has been joined on stage by many artists including Mark Padmore, Melvyn Tan, Andrew Marriner, Vladimir Ashkenazy, Guy Johnston, Alasdair Beatson, Tom Poster, Matthew Rose, Bellowhead’s Jon Boden and actor Timothy West. Wigmore Hall, one of the world’s great concert halls, specialises in chamber and instrumental music, early music and song. Now approaching its 115th birthday, Wigmore Hall is livelier than ever, offering music-making of outstanding quality and an array of activities in the broader community. With its infectious sense of adventure, it consistently captures the public imagination and broadens its audiences’ horizons. Wigmore Hall’s focus is on supreme musical works, best experienced with a powerful sense of immediacy. The repertoire extends 250 years on either side of Beethoven (born 1770) – from the Renaissance to contemporary jazz and new commissions from today’s most exciting composers. Bringing this music to life are the world’s most sought-after soloists and chamber musicians. Wigmore Hall also provides a showcase for exceptional young artists – some making their professional London debuts – and remains an essential platform as their careers flourish. Discreetly nestled in Central London, the Hall – renowned for its intimacy, responsive acoustic and its Arts and Crafts interior – has a capacity of 552 seats, but draws in audiences from far and wide through its enterprising use of digital media and its ambitious learning and outreach programmes; these go beyond concert audiences to embrace schools, nurseries, hospitals, community centres and care homes. As with all Spitfire libraries the musicians earn a royalty from every copy we sell. This royalty is also extended to The Wigmore Hall in the hope that it helps them continue the great work they do for music, for education and for the community. Gives you a quick and easy way to access, view and load the different articulations, mic mixes and essential controller functions which you can then re-assign to suit your workflow. A deeper but still simple UI panel that allows you to tweak the general settings. How many round robins you would like and how you would like them to behave. How would you like memory to be organised alongside pitch options and how velocity works. Quite simply a little inspiration machine. Not quite an arpeggiator, not quite a sequencer. This intuitive device allows you to build up complex patterns that react to your playing to achieve wild systems results tantalising Zimmeresque tension beds or cheeky multi-tonguing effects!